The Lincoln Stars will open the USHL 2010-11 regular season on the road this Friday night when they will faceoff against the Tri-City Storm in Kearney, NE. In five preason games, the Storm finished with a 3-2 record, while scoring 17 goals, and surrendering 16. One of their three preseason wins came against the Lincoln Stars on 10/16/10 when the Storm skated to a 3-2 shootout victory in Kearney. The Lincoln Stars finished the preseason with a disappointing 1-3-1 record in five games played, scoring 13 goals and giving up 26. The puck will drop at 7:05pm at the Viaero Event Center. You can follow the game online via Pointstreak, listen to Stars radio announcer Mike Melbye on KLMS 1480 AM, or watch the game live on B2 Networks for $7. We will be blogging/chatting live for this game also. The Tri-City Storm are coming off an impressive 2009-10 campaign where the finished the season with a 29-26-6 record and a playoff berth. 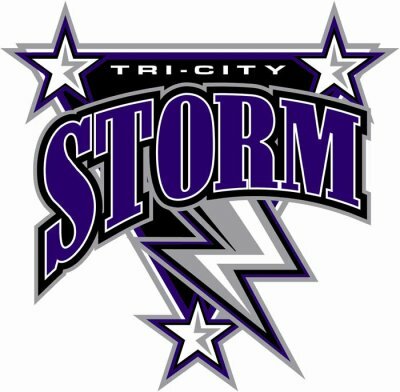 Considering how bad the Storm were in 2008-09 (11-48-1), Tri-City did a lot of good things last year to become relevant in the USHL again. Having a player like Jaden Schwartz in the lineup certainly helped the Storm last season. Schwartz, who was drafted in the first round of the 2010 NHL Entry Draft by the St. Louis Blues, is now playing collegiate hockey for Colorado College. The Storm will obviously miss Schwartz this season, but they will look to improve on last season's record with returning players such as Rick Pinkston, Cody Murphy, Mario Puskarich, and former Stars forward Tucker Brockett. Second-year head coach Drew Schoneck has done a great job in Kearney in leading the Storm out of the basement and back into the spotlight. On the other side of the coin, the Lincoln Stars are coming off a disastrous 2009-10 season in which they finished last in the USHL with a record of 16-36-8, while breaking numerous records that probably should have never been broken. Former head coach Jimmy McGroarty was demoted to associate head coach, and former Stars assistant Chad Johnson was brought in as head coach to help right the ship. Assistant coach Nick Fouts resigned to move back home to Washington, and former Stars defenseman Andy Schneider was hired to replace Fouts on the bench. Head Coach Chad Johnson has since had to leave the team for an indefinite time period due to a personal illness. Johnson's timetable to return to the team is unknown at this time. The Stars will return eight players from last year's squad, not including goaltender Kevin Murdock who last played for the Stars in the 2008-09 season. The Stars will find themselves shorthanded when they matchup against Tri-City Friday night. Much like last season, the Stars have suffered a number of early-season injuries that will keep some key players out of the lineup. Garrett Peterson, Josh Berge, Jared Hanson, Brad Wilhelm, and Cole Martin are injured and will not be in the lineup Friday night. Forward Bradley Hawkinson, who is a draft pick of the Stars and played one preseason game for Lincoln, has been called up and will play Friday night. We will be blogging/chatting live for the game tomorrow night, so if you're not attending the game, check back here around 6:45pm Friday evening to participate in the fun. I will post that article Friday afternoon sometime. If you are planning on attending the game Friday night in Kearney, cheer loud and proud for the boys! Hockey season is here! GO STARS!! will be in Kearney tomorrow for the game. Can't wait for the season to begin! Well that's a bummer to be shorthanded for the first game of the year but It's a new year, so lets go get em boys!! Wow, Yeti you've been busy today. Love reading all these new articles. Cant wait for the season to start tomorrow. I wish I could be there tomorrow night but I hope the Stars fans who go cheer loud for our team!! Go Stars!!!! Good point, nutz. That's what great about the USHL and hockey in general. There's always next season. We've seen in the past that the USHL can be very cyclical. Three season ago, the Green Bay Gamblers were the worst team in the USHL. The next two seasons they were one of the best teams in the league. I'm confident the Stars can rebound from last season. I know the players from last year are hungry and want to prove the Stars are not a last place team. I will be there tomorrow. Thanks for the update Yeti! We received our season tickets yesterday and I'm so excited about (finally) being a bona fide season ticket holder! I may live behind enemy lines now and am not driving 2 1/2 hours each way to the games, but I feel like more of a "legit" fan now. I will be on the road tomorrow night and would like to know how to pick up the audio on my cell phone if it's possible. Any tips or advice anyone? Bueller? Tried the links on the Stars site and KLMS to no avail. I suppose I may have to settle for the pointstreak updates, but listening to Mike call the game and hear the best fans in hockey cheering would be the next best thing to being there. No matter what, we'll be with you all in spirit tomorrow. I doubt I should be in here chatting if I'm driving, but I may have my co-pilot try it. Good luck tomorrow guys, and safe travels to you fans making the trek to Kearney. for competition. Hope lines and defensive pairings are established. Hoping the new coach gets healthy quick. Not a fan of the old coach and new replacement. Best of luck Stars. Planning on heading out to the game. Hoping for a good win, but with out team only being on the ice together a couple weeks, a competitive loss would be ok. Hoping coach is back soon. I too was never a jimmy fan. Great at trades though. It's a new season, last year is over so lets stop bashing on the "old coach, and new replacement". What would the stars have done if Jimmy hadn't of stuck around when chad got ill? i'm not bashing on Andy, but he is in his first year of coaching. We don't know what this year will bring. you could have left it as..."hoping the new coach gets healthy quick". Thanks! Go Stars!!! Let the games begin.Why is our team two weeks behind the other teams?